Kopper enjoys his light therapy. Yes, they really work. There are over 1000 independent research studies that prove light therapy is helpful for a wide variety of medical conditions. You can scroll down and find links to two studies that show light therapy will provide pain relief and reduce joint inflammation caused by Arthritis. Canine Light Therapy pads provide the same deep-red and near-infrared energy that are used in those studies and provide the same kind of pain relief and reduced inflammation; just look at the two happy customers below. Rosie enjoys her light therapy with her toy turtle. Canine Light Therapy pads cost much less than lasers or even a regimen of laser treatments. A laser will cost you several thousand dollars; laser treatments cost $50 to $100 each and a typical regimen is once or twice per week. The Canine Light Therapy pads start at a couple hundred dollars and will provide thousands of treatments. Turkey likes his light therapy too! Just lay the Canine Light Therapy pad on your dog or wrap it around the leg and plug it in. There are no settings, dials, or switches. The pad will shut off automatically after the full treatment time of 15 minutes. Then simply remove the pad and unplug it. It is just that easy; anyone can do it. Great Heart falls asleep during his light therapy. 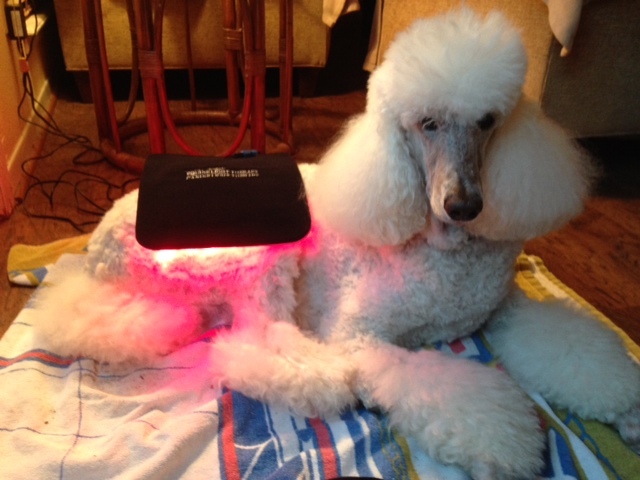 Use Canine Light Therapy pads at home; it simply can't be more convenient. There is no need to load your dog into the car, drive to the laser treatment, wait your turn, pay for the treatment, load your dog back in the car and drive home. 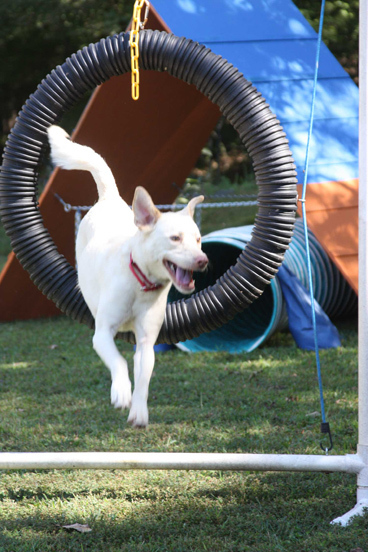 Just use your Canine Light Therapy pad at home where your dog is more relaxed, more comfortable, and you can avoid the extra stress on the joints caused by getting in and out of the car. Canine Light Therapy pads are very powerful but very safe. You do NOT need safety goggles or special training that you would need with lasers. An improperly used laser can damage tissue or delay the healing process in what is called the "laser inhibition response". Canine Light Therapy pads will not damage tissue and there is NO risk of the "laser inhibition response". You love your dog because it is part of your family. No one wants to see loved ones suffering or in pain. 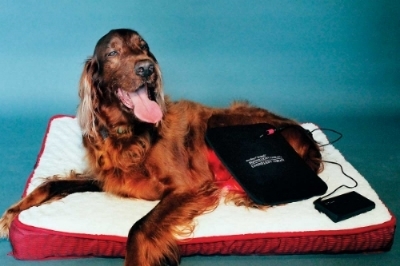 Start giving your dog relief and order your Canine Light Therapy pad today. Research: "Effect of light-emitting diode (LED) therapy on the development of osteoarthritis (OA) in a rabbit model"
"Conclusions: There was general preservation of the articular surface and decreased levels of inflammation in the osteoarthritic joints with the application of LED therapy." Research: "Biphasic Dose Response in Low Level Light Therapy"
light for healing and pain relief. "The use of low levels of visible or near infrared light for reducing pain, inflammation and edema, promoting healing of wounds, deeper tissues and nerves, and preventing cell death and tissue damage has been known for over forty years since the invention of lasers." "Low level laser therapy (LLLT) is the application of light (usually a low power laser or LED in the range of 1mW – 500mW) to a pathology to promote tissue regeneration, reduce inflammation and relieve pain. The light is typically of narrow spectral width in the red or near infrared (NIR) spectrum (600nm – 1000nm), with a power density (irradiance) between 1mw-5W/cm2. It is typically applied to the injury for a minute or so, a few times a week for several weeks. Unlike other medical laser pro- cedures, LLLT is not an ablative or thermal mechanism, but rather a pho- tochemical effect comparable to photosynthesis in plants whereby the light is absorbed and exerts a chemical change." I bought the medium sized pad at the Houston World Series of Dog Shows. I've been using it on my dog who has IMPA (Immune-mediated polyarthritis). She is moving better, and most dramatic, she has gotten off my bed unaided at least 3 times in these last two weeks. It has been months since that has happened, except maybe the day after we see our vet chiropractor. Today Candy had her regular appointment at the vet chiro. I brought the pad to show off and Dr. Robin already knew about it. She found Candy much looser, and her head and neck were in much better alignment than usual. Many of our clients incorporate the use of "Gospel's" Light Therapy pads as a regular part of their daily routine. It is a non-invasive, easy to use, affordable way to help keep your partner comfortable and happy! Click here to see what some of our clients have to say about Equine & Canine Light Therapy! Questions? Please call us, 615.293.3025. We are here to make you and your buddy feel better! We've been helping people help animals since 2004!